The Pocket Therapist application supports the therapeutic relationship and the psychotherapeutic work associated with Autonomic Nervous System (ANS) arousal and emotion regulation. What is the Pocket Therapist? The Pocket Therapist is an application for psychotherapists and health care professionals to support the client’s therapeutic process as part of the therapeutic relationship. The Pocket Therapist has been developed to primarily support trauma therapy but is well suited to all psychotherapeutic work related to the regulation of ANS arousal and emotions. The Pocket Therapist exercises enable the client to practise the regulation of his/her own ANS. The client learns to identify the situations that lead to changes in the state of the arousal and the most appropriate means of regulation. With the help of this application they can easily monitor their state of being and changes in their regulation skills both in the short and long term. With the Pocket Therapist’s Stabilisation function the client will get support and help for situations when his/her own regulation skills are not yet fully developed irrespective of time or place. The client can make notes, in the application, about his/her experiences and thoughts both for his/her own use and for sharing with the therapist. This cumulative information will help assess the progress of the therapy process. Contact us to get the licence for the Pocket Therapist. The package includes instructions on how to use the Pocket Therapist. Download Trial Questions? Contact us. The Pocket Therapist application is based on the neuro-physiologist Stephen W Porges’s Polyvagal Theory about the ANS and how to apply it to trauma therapy. The Pocket Therapist has been developed by Marko Punkanen PhD, Trauma Psychotherapist and Trainer. He has been working with severely traumatised clients since 1999. The Pocket Therapist has developed from the practical need to find new ways to help dysregulated traumatised clients to learn self regulation skills. The Pocket Therapist has been developed in collaboration with clients and it will give them concrete and active tools to regulate trauma based symptoms, in a way that is accessible and discrete, irrespective of time or place. Clients have experienced the Pocket Therapist to be helpful and user friendly. It has offered support and help to alleviate trauma symptoms even on a bus or busy train without drawing the attention of others. With the Pocket Therapist the clients have been able to practise the exercises for ANS regulation outside of the therapy sessions at a time suitable to them. Marko Punkanen PhD is a trauma psychotherapist, music therapist, dance movement therapist, researcher and trauma psychotherapy trainer. He has almost 20 years experience in the treatment of severe traumatisation. His specialist area is in the treatment of complex and attachment trauma, the bodily symptoms of trauma (somatoform dissociation) and the use of the body in trauma treatment. 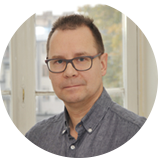 Dr Punkanen is the first and currently only certified Sensorimotor Psychotherapy Psychotherapist® in Finland and he is also a trainer in Sensorimotor Psychotherapy. Trauma symptoms (dissociated symptoms) quite often include a dysregulation of the ANS which can lead to an uncontrollable hyper or hypo arousal. Due to traumatisation our capacity regulate our ANS and strong emotions may be compromised. In trauma psychotherapy an essential goal is to learn to recognise the changes in ANS arousal and find suitable tools and exercises to develop regulation skills. Clinical experience has shown that developing self regulations skills demands systematic practise. With the help of the Pocket Therapist’s exercises the therapist is also able to encourage and motivate the client to practise regulation of the ANS outside the therapy sessions. The Pocket Therapist offers practical exercises for the client in an accessible form. It is possible for the therapist to tailor the recommendations for each client’s needs at different stages of the therapy process. The Pocket Therapist application helps clients to recognise the triggers of their trauma symptoms and find suitable regulation tools for each event. The Pocket Therapist application helps clients to recognise the triggers of their trauma symptoms and find suitable regulation tools for each event. With the Pocket Therapist’s Stabilisation function the client will get support and help for acute and challenging situations when his/her own regulation skills are not yet fully developed irrespective of time or place. The content of the message of the stabilisation function can be either that which comes with the Application or tailored for the individual client and recorded by the therapist. The Pocket Therapist Application will never make a live link connection between the therapist and the client. Clients’ notes in the application help the therapist and the client assess the progress of the therapy process. The client is always deciding what she/he is sharing with the therapist in the therapy sessions. The client's notes are only accessible from the client's application and never sent to the therapist. Please fill the form below before downloading the application. This information will be needed for activating your trial version. You will get an activation link through a text message to your phone. Thank you for your interest. You'll receive the activation SMS once we have processed your request. Download links will also be sent with the activation message. If you have any further questions contact us using this form. Thank you for contacting us. We'll be in touch if necessary.